for a chance at my other giveaway, click HERE. If you would like to win, leave a comment. 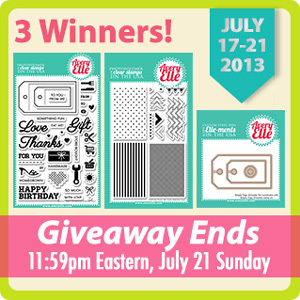 There will be three random winners (one for each stamp/die listed) drawn from comments left on all of our blogs. The winner will be announced on Nina's Blog on the 22nd. If you feel inspired by these products, create and post HERE. I am going to enter this card in the Casual Fridays Challenge, polka dots! paper is by Maggie Holmes for Crate Paper...IT"S INCREDIBLE. sequins are from Avery Elle, a gift from my friend Yuki! and the stamps are all the Texture Tiles set! loved how you used textures for your clouds. Love those textured tiles!! Great card! You're on a roll with the most fabulous uses of clouds, Wida! Love this dreamy card! Very pretty card. I like all the patterns on the clouds. SO beautiful! Those clouds are so dreamy!!! Love the textured clouds! Your card is gorgeous, Wida! Great use of patterns to add texture on this card design! Those textured clouds make the card fun. Wida, what an awesome scene! You've incorporated each of the patterns and colors perfectly! Oh Wida this is just gorgeous! I love how you used the stamps and that soft color combo makes me want to drift away! Seriously fantastic! 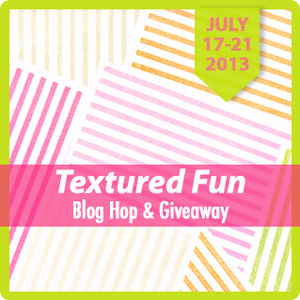 Love the textured clouds, the cloud paper and the sequins, awesome design Wida! Such a sweet card...the colors are so soft and dreamy! Beautiful, soft card. Love the textured tiles. Ooh, love the textured clouds - great way to use the tiles! 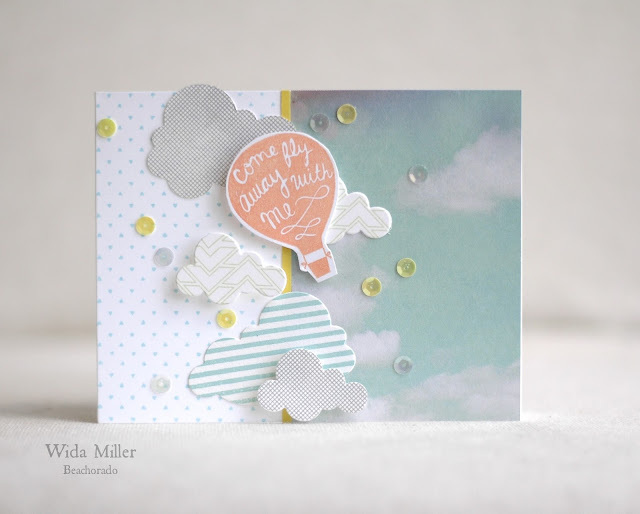 A gorgeous texture filled card, love the clouds! Fun card :) I love the texture stamped clouds. And the pops of sequins are the perfect touch . This card makes me so happy, sigh. That is all. Clouds make me happy! This card makes me happy too! Love it! The hot-air balloon is so fun! Great card, love the colors, thanks for sharing it. LOVE the card!!! Thanks for the chance to win~! What absolutely fun clouds. I honestly would not have thought about texturizing clouds. Great job. Great card. What a beautiful card. Reminds to pull out my cloud die which I have not yet used. wow that is so pretty...love the image and how the sentiment is inside the balloon! Oh, so pretty. Love those clouds with different prints. Very creative. This is fabulous!!! I LOVE the clouds! Love how you did the clouds each with a different texture print. What a pretty card!! Your card is super gorgeous! Never thought that textured clouds would make beautiful layout! Thanks for sharing it. Great idea with the clouds!! Awesome card! I love those clouds! They look so REAL! Thanks for the chance to win these great stamps! I love this idea for clouds! Sweet card. Brilliant card! I would have never thought to use these stamps to created patterned clouds, and I love how it looks! Oh, this is wonderful, Wida! 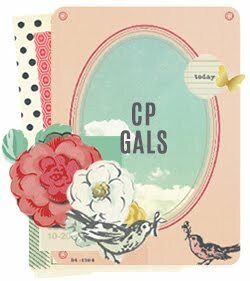 I love the diecut clouds paired with that background patterned paper-- so striking! So soft and pretty! Love that Maggie Holmes paper and those gorgeous sequins! I absolutely am in love with this card. You've combined so many patterns in such an elegant way. Thanks for sharing. This is a wonderful card. Love it. TFS. Fabulous card. Love the balloon above the clouds. grt card...lovd d way u used the patterns...superb. Very cute and clever card. Thanks for the chance to win. Wow! Wida, this is so beautiful! Ohh I love this sky scene with textured clouds, very pretty. The color combo is just perfect. Oh so cute! Love the balloon! awesome give away and LOVE your card! Fabulous patterns and papers! Ooooo...lovin' those patterned clouds and hot air balloon, Wida!! This card has such a dreamy feel to it! Awesome creation! You're a master! What a great design, mix of colors, trendy stuff ... well you name it, it's here! Wonderful card, Wida. So glad you joined the CAS-ual Fridays Challenge! Love the textures you created. fabulous! LOVE the sequins & cloudy sky background!! Congratulation on the Contender shoutout from CFC for this fun patterned and polka dotty card, Wida!! Wow! You got 70 comments! This card gives such a happy vibe, it is sure to brighten someone's day! Love the sky on the right. Is that a patterned paper? Really love the way you used the textured tiles on your clients - simply genius! very pretty love the clouds! 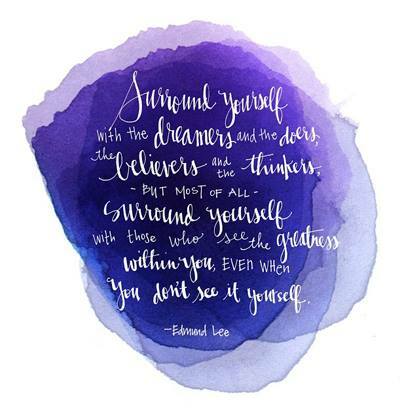 I alway stalk your blog for inspiration and I have lifted few but most of all admired. I would love to win that collection. Such lovely colors - soft and purty clouds. Congrats on your shout out at Casual Fridays!